Gabriel Martinez, Perpetual Care, 2016 (detail), sanded demin on linocut, 72 x 120". In this multigenerational exhibition curated by Doah Lee, five interdisciplinary artists uncover, celebrate, and question LGBTQ histories and aesthetics while wrestling with their own connections to and alienation from queer history. 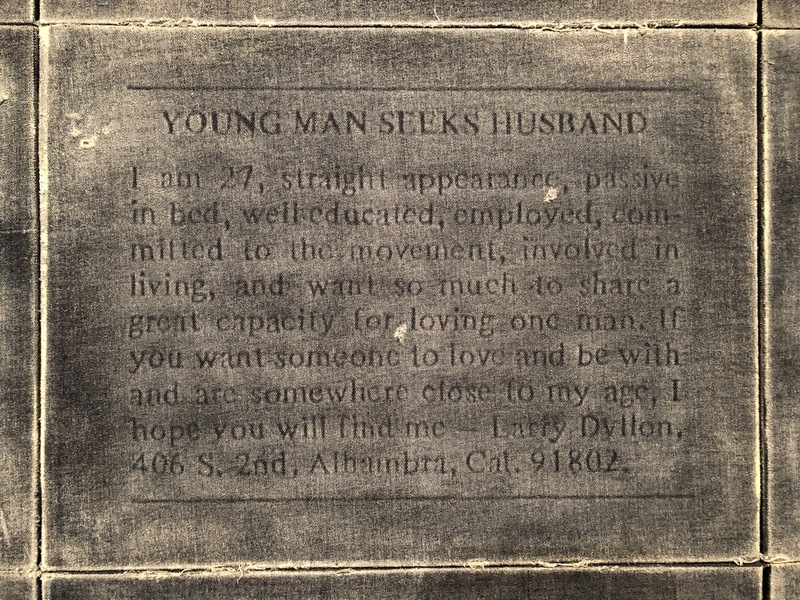 Gabriel Martinez’s Perpetual Care, 2016, displays heart-wrenching, humorous, and sometimes racially discriminatory personal advertisements—notably, I DON’T WANT TO GROW OLD ALONE, DO YOU? and HOT WHITE BUNS—that the artist unearthed in the William Way LGBT Community Center’s John J. Wilcox, Jr. Archives in Philadelphia, the city’s central resource for local queer histories. Each ad was enlarged to poster size, printed and etched on a linoleum panel, covered with denim, and sanded down to reveal the text underneath. The process references a comment the artist’s friend made, about sanding the crotch of his jeans to signify virility. These panels are arranged in a tender tactile grid that commemorates forgotten and perhaps unrequited desires. On another wall hang Keenan Bennett’s small black-and-white plywood reliefs, Tile Floor, Scrubbed Hard 4 and Tile Floor, Scrubbed Hard 5, both 2017, whose painted hexagonal patterns recall public bathroom flooring, suggestive of cruising. The center of each tile has been sanded down, which echoes the process in Martinez’s work, but here signals a conflict of appearances, revealing the raw wood beneath the veneer. A strong lesbian and trans presence permeates the exhibition—a curatorial decision that recognizes the even greater historical invisibility of women and nonbinary folk. Jesse Harrod’s mixed-media drawing Lesbian Agenda, 2016, and Amy Cousins’s protest-sign-style drawing Thousands, 2018, proclaim their wry truths in capitalized headlines: In the latter work, the phrase 1,000S OF ANGRY DYKES CAN’T BE WRONG is rendered in curvy graphite marks that defiantly resemble pubic or leg hairs. Heather Raquel Phillips’s video Hair Gallery I & II, 2018, which intimately documents the artist and other subjects stroking and removing each others’ body hair, meditates on the communities of care that, alongside unwavering protest, make risking such queer visibility possible in this moment.